I believe in sustainable living. Whether you are on the move or staying in your own city for months, leaving no mark or close to none on the planet when we go out and living your life is in my eyes the best gift of all. Limit my plastic footprint as much as possible in my daily life. I realise this will impact various aspects of my life, including and mostly how I shop for groceries: going back to basics, like buying loose items rather than pre-packed ones for instance. I have already stopped buying mineral water bottles and invested into a brita which I am proud of. Yet, there remain SO many more steps to take to achieve my goal, but I know am going in the right direction. Give some of my time to animal shelters in Paris. So many cats and dogs are abandoned every year and rescued into a shelter – while I am currently unable to take one at home, I want to give them the love and care that they need, and am keen to volunteer some of my time to cuddle them and help, no matter how small. 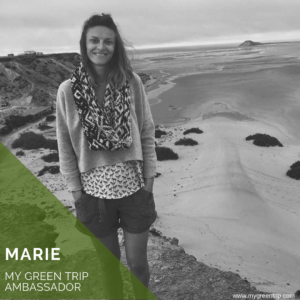 I am thrilled to partner with My Green Trip and become an Ambassador in Paris. I have been looking for ways to get involved in acting for the planet for months now, and My Green Trip presented itself as an obvious way. Right time. Right place. Right people. Being an Ambassador will allow me to support and take action for a cause that I strongly believe in, and hopefully let the message and good vibes ripple around me. I have been feeling hopeless not knowing where to start for months but so desperately wanting to get involved — the collaboration with MGT is what I have been waiting for. Watch out for Paris-based workshops and cleaning sessions. And did I say I love traveling ?